Teacher Resource Center of the North Bay (TRCNB) is the first and only FREE classroom supply store in Northern California. Here teachers can shop for basic core supplies needed by their students to succeed in the classroom. TRCNB, a volunteer community based non-profit organization is thriving because of the generosity of individuals, small businesses and large corporations who believe that our children are our future and deserve the best learning environment we can provide them. Who would believe that nearly a third of Napa County’s households qualify for the federally sponsored free and reduced lunch program for their school age children! In fact, nine of Napa County’s neediest schools have a 70% or higher participation in this program. These same students who can’t afford lunches can’t afford school supplies. We fill that need by offering FREE classroom supplies to public school students throughout Napa County to include Pope Valley, Howell Mountain, Calistoga, St. Helena and Napa Unified School Districts. 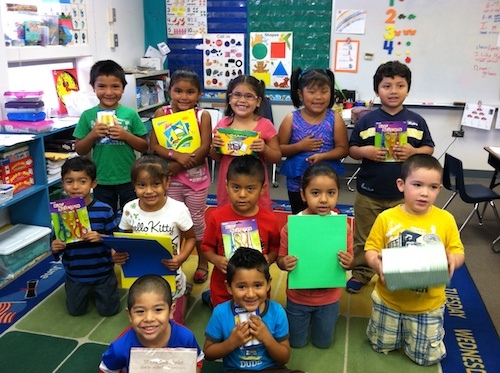 Teachers are invited to shop at our FREE store once each semester for needed supplies. Having the necessary classroom materials creates an equal playing field for all students and improves students’ self-esteem and confidence. In addition, the financial burden on teachers to spend personal funds averaging at minimum $500. due to federal and state budget cuts is reduced dramatically. We need both monetary and in-kind donations to keep our shelves stocked with pencils, copy paper, glue sticks, crayons and more. If you would like to donate, please click here for more information. If you would like to volunteer, click here to learn more. If you are a public school teacher in Napa County, click here to learn more about shopping at our Free store.